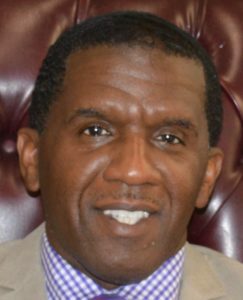 Andre Hollis, who was born and raised in Newark and has over 20 years experience in education, was appointed Principal of Weequahic High School in October. He began his career in education serving as a teacher-leader and school leadership team and technology coordinator for the Plainfield Public Schools and was named teacher of the year for Barlow Elementary School in 2001. In 2006, Mr. Hollis was selected as the Director of New Horizon Community Charter School, a K-5 elementary school in Newark. Among his accomplishments, Mr. Hollis earned a Master’s degree in Education and Supervision from Cambridge University in Massachusetts, and a BA from Rutgers University. He was accepted to Harvard University’s Principal’s Institute where he trained alongside educational leaders from around the world. A Vailsburg High School grad, Andre is one of the founding members of Black Nia FORCE, the Newark chapter-based organization that initiated citywide feedings and clothing, voter education and registration, cultural programming, mobile health screenings, and rental assistance. Mr. Hollis has made numerous professional presentations, including workshops on establishing school and community partnerships, providing extra time and support for students, and integrating technology into education. He has also served as a coordinator with The Coalition to House the Homeless, an initiative that provides overnight shelter to the underserved population. Mr. Hollis seeks to provide the kind of leadership that will create a school environment that offers rich instruction, promotes the exploration of new ideas, and fully meets the needs of all students. He feels truly honored to be the Principal at Weequahic and looks forward to new challenges and many successes in the coming years. Finally, on a personal note, his greatest joy is being husband to Jackie and father to 3 children, Travis, Danielle, and Adjua.